In this book, Stan Chu Ilo offers an integral theology of development and a critical social analysis of different development theories and practices in the world, especially in Africa. Ilo offers a comprehensive biblical, anthropological, and theological foundation of the principles and praxis of Catholic social ethics from the Second Vatican Council to Pope Francis. Drawing from the social encyclical Charity in Truth, Ilo shows how Catholic social teaching responds to some of the challenging questions and concerns of our times in relation to human rights, ecology, globalization, international cooperation, development and aid, human and cultural development, business ethics, social justice, and the challenges of poverty eradication. He creatively applies these principles to the social context of Africa, and lays a groundwork for sustainable Christian humanitarian and social justice initiatives in Africa. ""Ilo focuses particularly on the importance of African traditional culture, especially the Ubuntu sense of community, at the heart of the ability of Africans to control their own development. He emphasizes the need for the church to recognize the deep roots of traditional religious cultures of Africa and to find ways that the gospel can enrich, not replace, those traditions."" 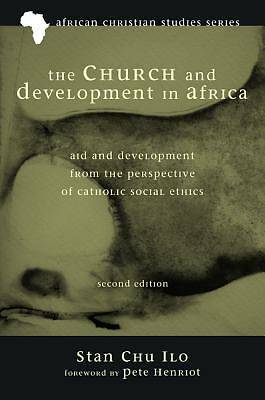 --James R. Stormes, SJ, Theological Studies ""The thorough, broad perspective Ilo provides on development in Africa, particularly from a Catholic perspective, makes this book an invaluable resource. It is a significant contribution to development literature. The author's outlook is starkly realistic and refreshingly hopeful for the future of Africa."" --W. Jay Moon, International Bulletin of Missionary Research ""What an epic book This is a profound and important book. Stan Chu Ilo takes us on a powerful journey through Catholic theology to Africa, its history and the development challenges of today. It is a book full of both personal passion and systematic rigor. It interweaves personal story, deep theological reflection, and robust academic analysis to reach workable and practical principles for aid today. It brings a fresh, African and Catholic perspective to an aid literature, populated largely by defunct Western prescriptions."" --Rich James, co-author of Capacity-Building for NGOs: Making it Work ""Imagine a Western church leader or church member interested in donating to an overseas cause, in a judicious way. Or, imagine a politically minded person, wanting to think through the relationship between Christian faith and aid and development. Then again, perhaps the reader simply wants to learn more about Catholic social ethics, African theology, or the link between dogmatics and social justice. There are many sorts of reader to whom this book would appeal, and that wide-ranging application is part of its appeal."" --Stephanie Lowery, Wheaton College ""Theologically, the book converses mainly with Catholic theology and social ethics. But its topic and message, like that of Catholic social teaching as a whole, can be appreciated by all those working toward a 'civilization of love' and particularly animated by Christian faith."" --William P. Gregory, writing in Missiology Stan Chu Ilo is a research fellow at the Center for World Catholicism and Inter-Cultural Theology, and Assistant Professor of Catholic Studies and World Christianity at DePaul University, Chicago, USA. He is also the founder of a registered Canadian Charity, Canadian Samaritans for Africa which is actively involved in social justice initiatives and poverty eradication programs and projects in four African countries. He is the editor of African Christian Studies Series for Pickwick Publications, an imprint of Wipf and Stock Publishers.